Piggy bank is one such equipment which is used by people of all ages. From a toddler who has just started knowing the importance of money to a middle age man who knows the value of every penny saved, a piggy bank is a life saver for everyone who thinks of their future when it comes to money. However, when it comes to piggy banks, each one has his or her own requirement- some like to save the money for short term whereas others like them for long time. For this reason we have brought to you some of the most innovative piggy banks to suit your requirement. 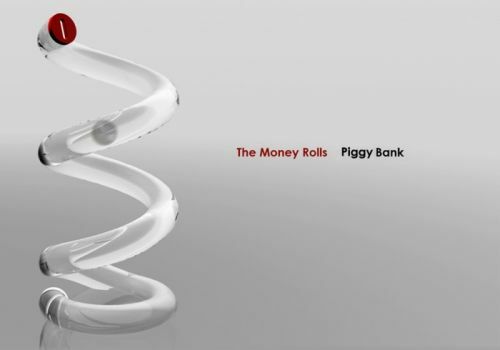 The “Money Roll Piggy Bank” is a concept that is as attention grabbing as a piggy bank possibly can get. The see through spiral shape adds a dash of difference to this unusually shaped piggy bank. It’s going to be fun for kids to watch their money roll down and this play of sorts may attract them into putting their money in the Money Roll Bank rather than spending it. The “Lo-Fi Resin Piggy Bank” looks so realistic that people might not guess that it’s a piggy bank. Made of resin, it will look cool even if it’s just hanging out on your shelf sans coins. This Lo-Fi Resin Piggy Bank can be best gifted to any music lover. This ingenious and stylish cash depository boasts two slots for coin and bill insertion that is one on top and one on the front and an easy pull tab on the front for freeing your coins. 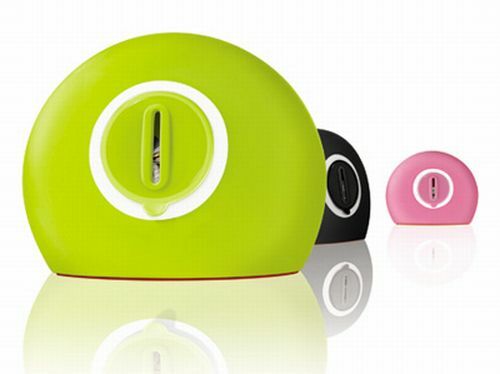 Made from soft PVC, this “Night-Lab Piggy Bank” also comes in different and bright colors. An icon of war can be transferred into a cute and peaceful coin bank. 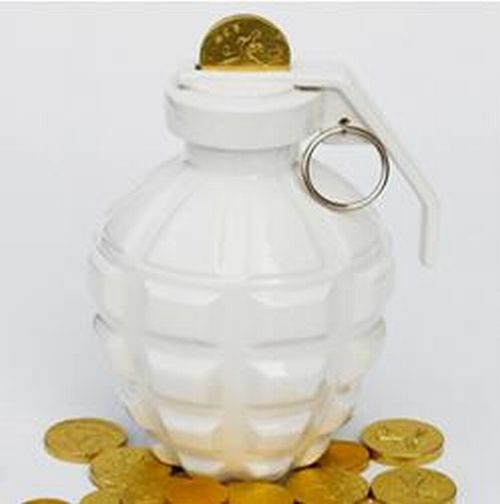 Designed by Owen and Cloud this “Love Grenade Piggy Bank” collection was a part of anti-war pieces. The grenade is painted white unlike its military counterpart, for white color is a symbol of love and everlasting peace. We all know we should save some money, but if it’s in our wallet, we are likely to spend it. That’s why this gorgeous “VOLCOINO Piggy Bank” designed by Karim Rashid, doubles as a sculpture and also hides your money, out of sight, out of mind! Its sleek design and chrome finish makes it look like a decorative piece. 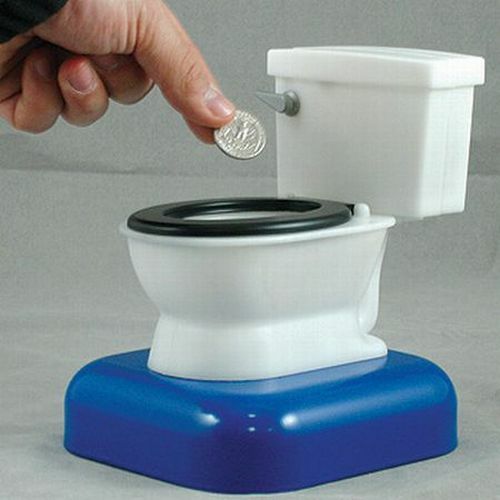 Nothing like throwing money down the toilet, unless it’s into this “Flushing Toilet Bank” complete with realistic details. You just have to throw a coin in, press the lever and watch your money disappear as you hear authentic flushing sound effects. No need to call a plumber to remove your coins, you simply have to twist the coin release on the bottom. 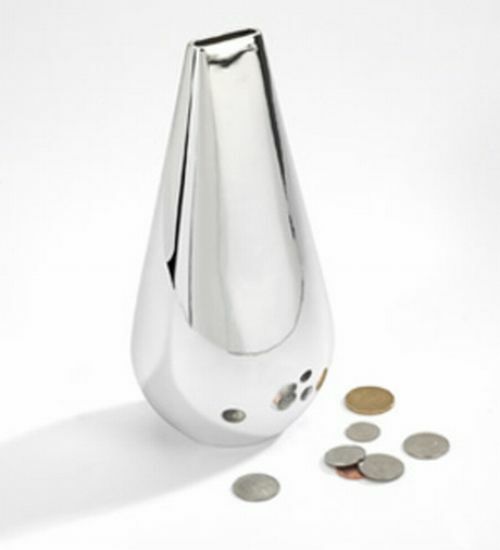 Here is a rather modern puzzle-like interpretation of the personal coin bank. The importance of stashing away some serious coin money should be taught at a young age. “Kasseli Piggy Bank” throws in a little brain work too. First, you need to construct the bank. Then fill it with coins, and when you need to collect your saving, take it apart. Then put it back together and start saving again. Interesting right? The cool bust bank starring Darth Vader himself holding his lightsaber as its guards is actually an inexpensive way to keep your change secured right next to all your other Star Wars geeky toys. 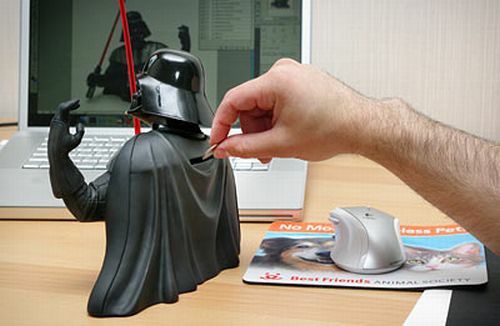 No one is going to steal your hard earned cash if it is stored in this fun Darth Vader Piggy Bank. 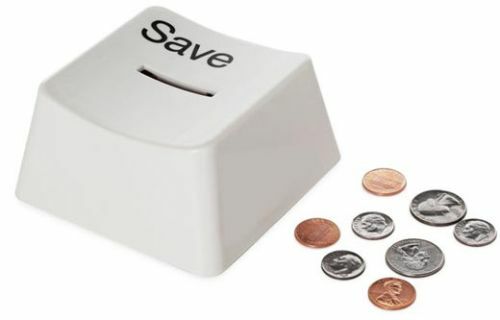 It’s a good gadget to make your children save their own money instead of spending it. 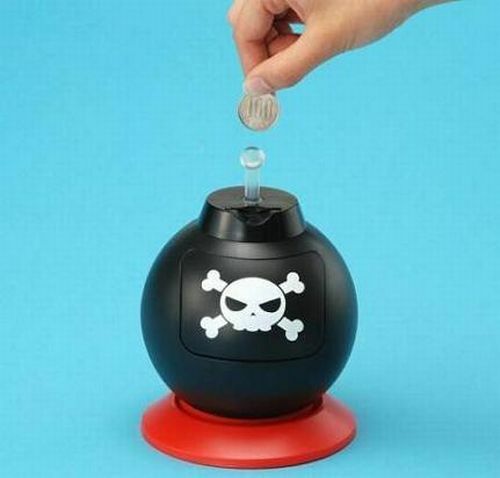 This “Bomb Piggy Bank” is not merely shaped like a bomb, but also blasts like a real one. This bomb will explode when you don’t put a coin in it every day. Of course, it won’t really explode but it will give a huge explosion sound and light up just like a bomb while sending coins all over your desktop. In addition it will remind you by vibrating and flashing before exploding. This can be a cool gift for those children who are careless when it comes to saving money. 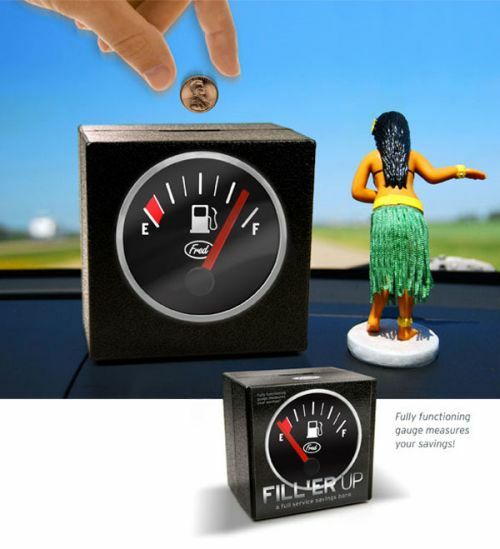 Give your savings a fill up with the “Fill’er Up Gas Gauge Piggy Bank.” This fun bank is a fully functional gas gauge. The more coins you put in, the closer the gauge moves to fill mark. 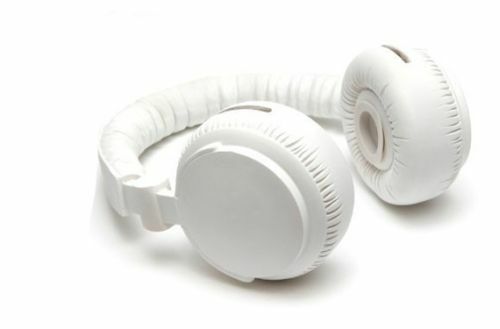 It’s great for your dashboard or as show piece for your home. The “Piggy Ball” is a piggy bank which is quite different from normal piggy banks. It has got several slots all around from where you can put the coins in, but in spite of so many slots, the coins in it will never drop out. 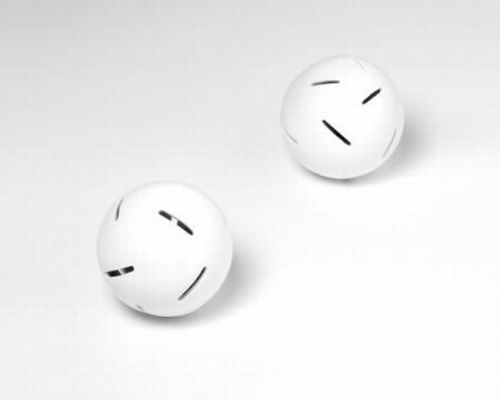 This Piggy Ball will not roll away automatically, due to the weight of the coins in it. To get the coins out you need to hit the ball open with a hammer. Times are tough and you know you should be saving more. Here’s the ideal way to put aside some extra cash for life’s little necessities. 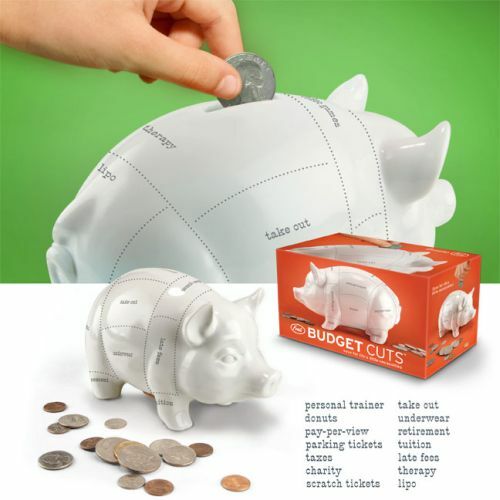 This “Budget Cuts Piggy Bank” helps you save money. This generously sized, durable ceramic piggy bank encourages you to save a few pennies for your indispensable personal trainer, for therapy, for parking tickets, and for retirement. Here is a great way to save some money and play one of your favorite classic games with the fun “Tetris Arcade Gaming Piggy Bank.” This fun mini arcade machine has a built in piggy bank and also an LCD screen and arcade style controllers that let you play Tetris. This would serve the dual purpose of entertaining the kids as well as inculcating them in the habit to save money. 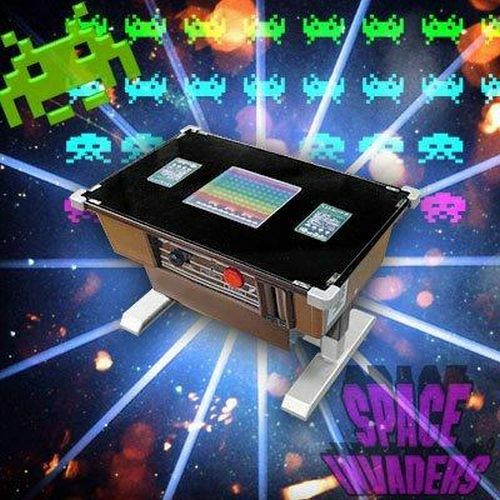 Now you can get your very own “Space Invaders Replica Coin Bank” and hours playing the greatest arcade game of all time right at home. This 1/6 replica of the classic Space Invaders lets you insert a 100yen coin in a slot and press the Hit button to start off with your game. Don’t worry about your 100yen, you can retrieve it from the machine and use it over and over again to enjoy this fantastic vintage game. You can also use it as a coin bank and store different coins in it. 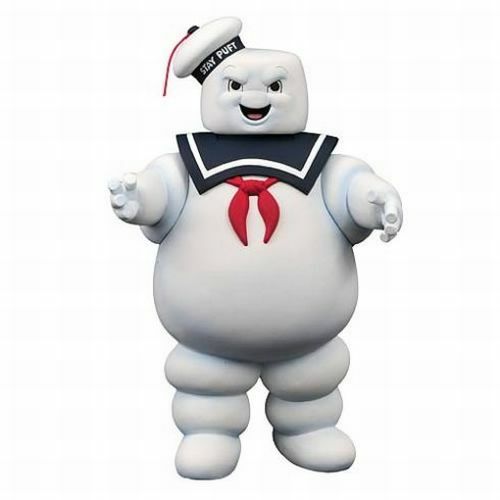 If you are a fan of the 1984 Ghostbusters Series, then you would certainly like this Angry Stay Puft Marshmallow Man Bank, Slimer Bank, and smiling Stay Puft Marshmallow Man Bank, to keep your money safe and secured. You can keep this “Ghostbusters Figure Piggy Bank” on your study table or somewhere near your workstation at office and I am sure nobody would dare to touch the money. 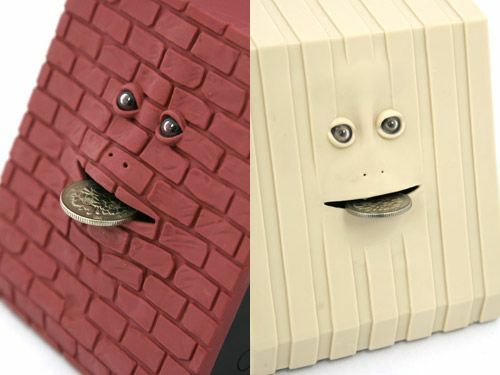 The “Face Bank” is money eating piggy bank robot which features an object sensitive sensor in its eyes to distinguish coins. And when I say ‘money eating’ I mean it, for it actually eats money. It moves its mouth and everything. For most of the husbands, this may look a lot like their “real life” bank. 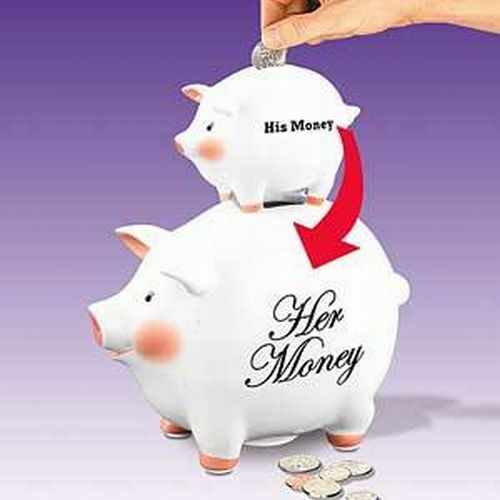 Even if you put a coin in His Money Bank, it will still drop down to Her Money Piggy Bank. Do you have the same experience? Funny right! This “Keyboard Inspired Piggy Bank” is a giant replica of the “Save” button from a computer keyboard. Perfect for desktop use, this chic piggy bank will complement any surface and are great for depositing loose coins and storing petty cash. This Keyboard Inspired Piggy Bank is a great gift for any geek. It might look like a box of fruit, but inside there’s a surprise! This “Itazura Bank” is just cute and adorable. You just have to place a coin on the fish bone-shaped button on the top of the piggy bank, which alarms the small kitty that lives inside the savings box. 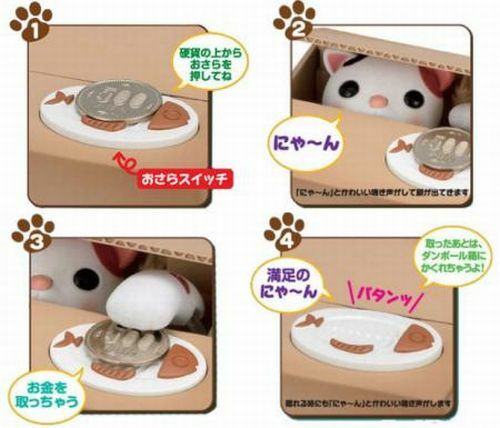 It meows, opens the lid with its head, reaches out its paw, grabs the coins, and moves back into the box with another meow. Cute right? Economically and conveniently, it will show the effect of photovoltaic to your children in the process of playing. 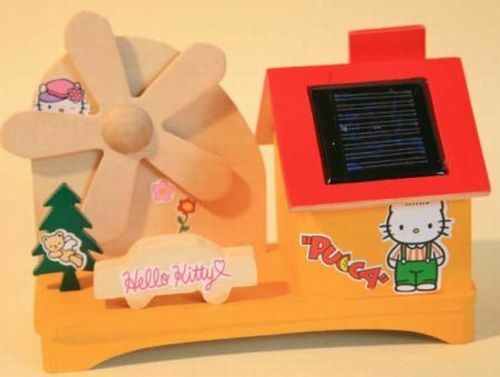 “Solar Money Saving Music House Piggy Bank” is a wooden wind-mill which rotates automatically and the sound box will play beautiful music when putting coins in the house. When the music stops, the rotation of the wind-mill will stop at the same time. Compared to the normal piggy bank, you will have more fun using the green Solar Wooden toy. You just have to keep the house in sunshine and the solar panel will start to charge the Rechargeable Button Battery automatically. 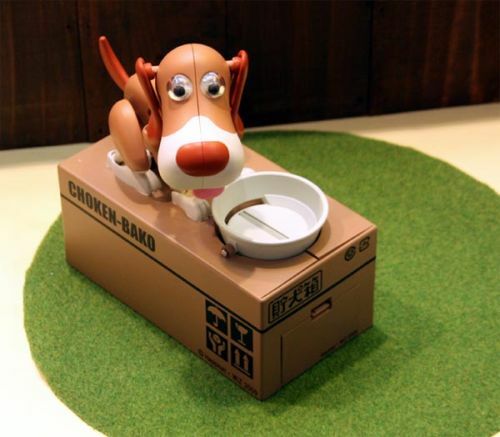 “Choken Bako- The Robotic Dog Piggy Bank” is a new crazy coin bank featuring a hungry robotic dog that will enthusiastically eat up every coin you put in his bowl. The bowl is big enough to fit coins of all sizes which are collected in the box underneath. If you’re looking for a cute present then this is a perfect thing for anyone and great way to promote saving too. 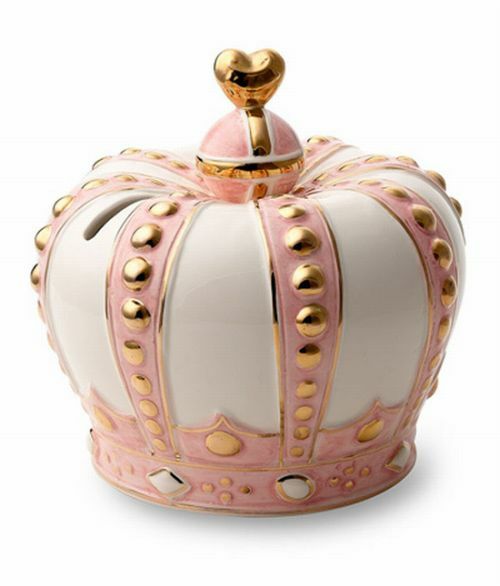 Now saving will be more exciting and fun when you keep your coins in this gorgeous “Juicy Couture Crown Piggy Bank.” The brilliant crown shaped container is made of ceramic and looks royal in its attractive colors and design. It will surely brighten up your interiors and encourage you to save more money.